This is a wonderful Miao Hmong Arm Wrap Silver Coiled Bracelet from the Hill Tribe people. The Miao are an ethnic minority group of people in China. They inhabit mainly the southwest region of the country. They are also found in the northeast of Thailand, where they are known as the Hmong. Miao silver is not pure silver, but an alloy of silver, copper and nickel. It’s a traditional material for making jewelry by craftsmen of Miao Hmong ethnic tribe. The percentage of silver is about 60%. Miao Hmong silver jewelry is distinctive for its design, style and craftsmanship. 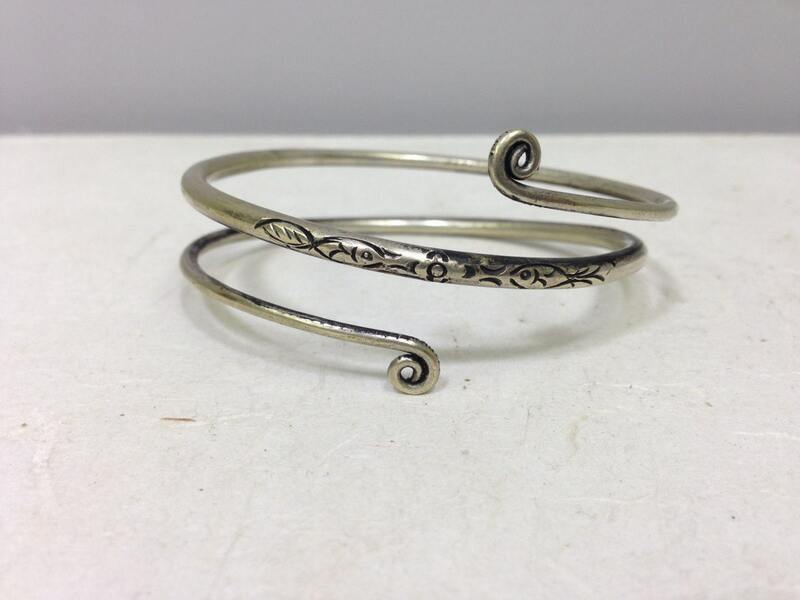 Miao Hmong silver jewelry is completely handmade, carved with decorative patterns. It’s not easy to make and there is no pair exactly the same. Miao Hmong people think silver accessories have spirits. Wear it more, clean it more, it will reward you with more beautiful luster. Miao silver often more expensive than 925 silver, mainly because the Miao silver workmanship are very exquisite, its value is mainly reflected in art. Miao silver process is complex, a Miao silver jewelry must go through the ten or twenty process to complete. 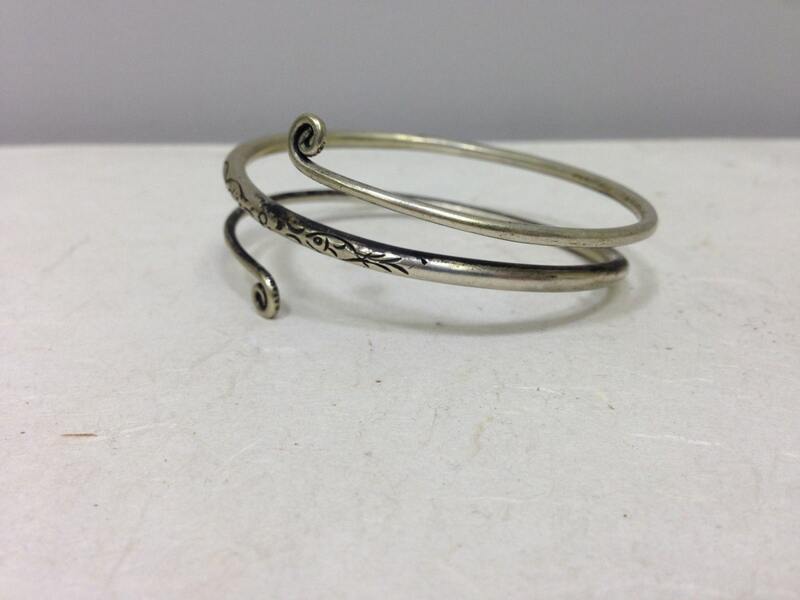 Miao silver jewelry all made by hand, this process to make to the silver simple natural, full of nostalgic charm. This cuff is woven in a double braid weave pattern which makes it quite original,and due to the Silver being soft the craftsman can manipulate into many interesting patterns and shapes. 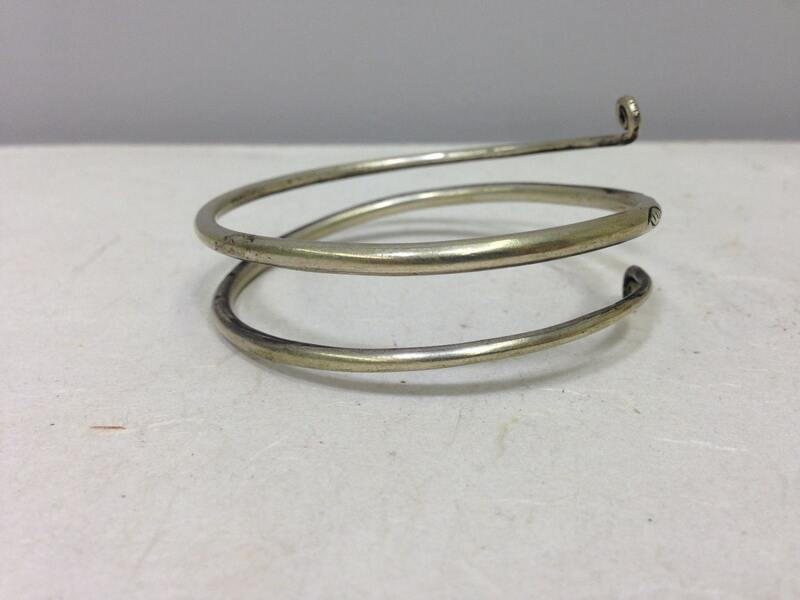 This cuff can be pulled over rings if wearing them and it is quite comfortable and lightweight. 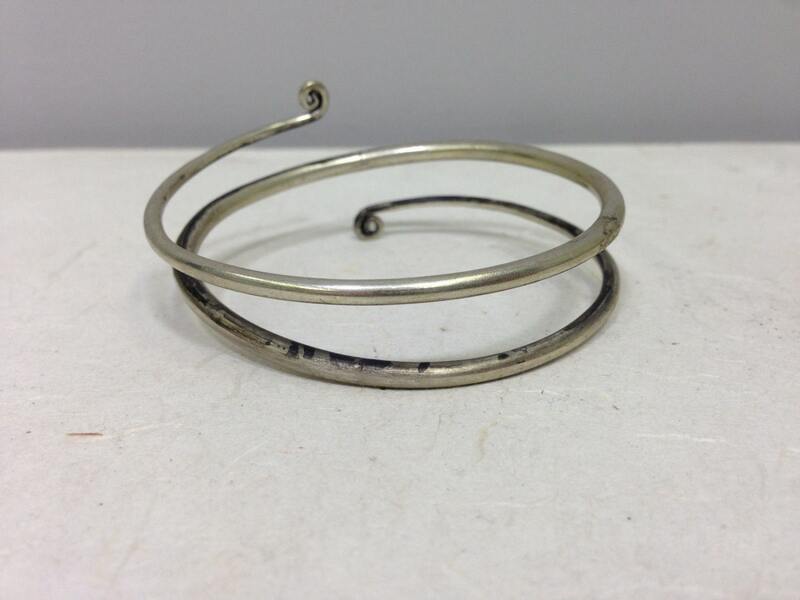 It is a fabulous old Miao Silver Arm Wrap Coiled Bracelet that can be worn by a man or a woman.